Yesterday was a worldwide USk sketchout, and I am swamped. so into freezing car and parked down the block and looked up at the studio. My finish room is in the corner of the building! I added watercolor back in my warm studio! Da Vinci Rose Dore is my go-to…. and Indian Yellow to my palette. Yummy paints. Da Vinci, Holbein and Daniel Smith Watercolors. 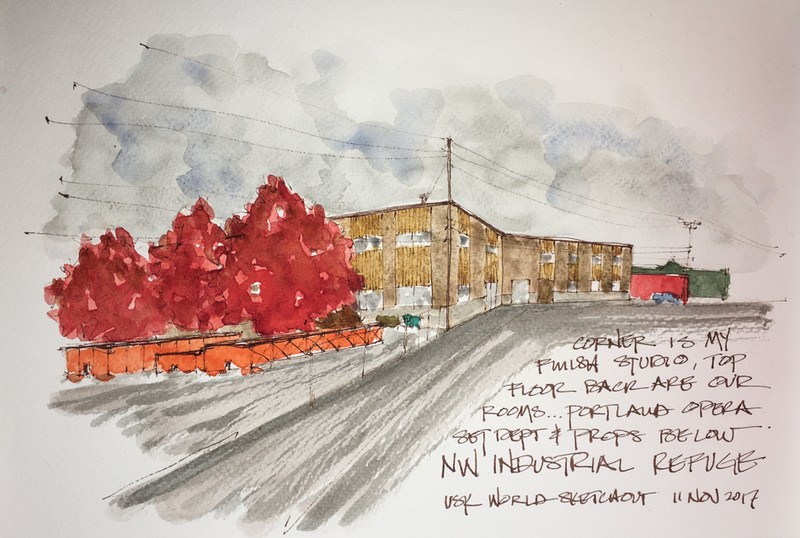 This entry was posted in architecture, art journal, challenge, landscape, sketchbook, sketchcrawl, urban sketchers, watercolor and tagged #danielsmithwatercolors, #davinciwatercolors, #nwindustrialsanctuary, #nwportland, #urbansketching, #USkGlobal24hrSketchwalk, art journal, Daniel Smith watercolors, De Atramentis Document ink, Holbein, Jinhao, Portland Oregon, Portland Urban Sketchers, Primatek, urban sketcher, urban sketchers, Urban Sketchers Portland, USk, watercolor. Bookmark the permalink. Wow what a sweet comment! Thank you. You touched my heart with that comment! Pretty trees and drawing, Katie. We have four maples behind our office that turn red like that every year. I’m going to miss them next year, after we move to our new digs. So you don’t like the Fabriano Journal? I don’t like their paper but would love to hear your reasons. Will definitely run right now to check out some of those DV colors you mentioned. Aren’t their paints yummy?! Here is a review from before I had tried Hahnemuhle journals. https://dkatiepowellart.me/2016/11/27/tools-favorite-journals/ I am going to write about journals again soon and will reiterate, as Ii finally nearly finished “THE” dreaded Fabraino journal. Slogging through. Mostly, the paper pills. It pills without me rubbing with a brush, whereas Moleskin and Hahnemuhle can take some brush scrubbing and not pill. Pilling is a deal breaker. I am astonished, because friends overseas love these journals, and I wonder if we get differnt watercolor paper in the journal. I put the label I have in the review in case someone finds a different water color journal. Fabriano was lovely to work with, sent me FOUR new A4 journals — the same. So now I have many to give away but they are nto great journals. (Want one?) I will use them for color tests. I’ve not tried their paper by itself. I love DV paint. They may become my go-tos. Oh I’ve seen your other article. I had just forgotten about it so thanks for sharing the link. I’m totally into DV paints also, and I’ll take your word for it on the Fabriano journals. I don’t like their WC paper one bit and ran into the same issues with it. (No flow or lift, some piling, etc) Sounds like the same stuff that’s in their journals. I wouldn’t slog through any more of them. You can always host some giveaways, put them on eBay, or post them in the WWG art supply trading group. I read and have a comment in me when I am less snotty-stuffed-head cold person! I love sketchbooks but then I am a book person / long-time journaller. I also love painting big on canvas. I am happy, in a nutshell, with hahnemuhle’s watercolor and moleskin’s watercolor paper. NO pilling, No watercolor floating on the surface. No bleed. I like the organization of them. Soemtime when I am feeling better I will show you my boxes of paintings… IF someone would do good paper in a square format then I’d be in heaven. Yeah Hahnemuhle’s watercolor books are lovely! Not WC paper, but probably the best in sketchbook format. I’m with ya – I’m totally a book person also. Voracious reader, write in them nonstop, and art journaling kicked off my entire artistic journey. We’ll see if I end up staying away from sketchbooks for good. Anyway, I hope you feel better soon, and yes, show me your box when you do! I love their watercolor journals too. I wanted to buy the A4 but hit the wrong key so have a couple of small ones… and a couple of the A4’s. I am SO glad to be free of the Fabriano Journal and into either Hahnemuhle watercolour (as opposed to the Nostaglie (which is more a writing/sketching/light watercolor journal). I bet you can’t stay away….